Fukuoka is the name of both the capital city and the prefecture. 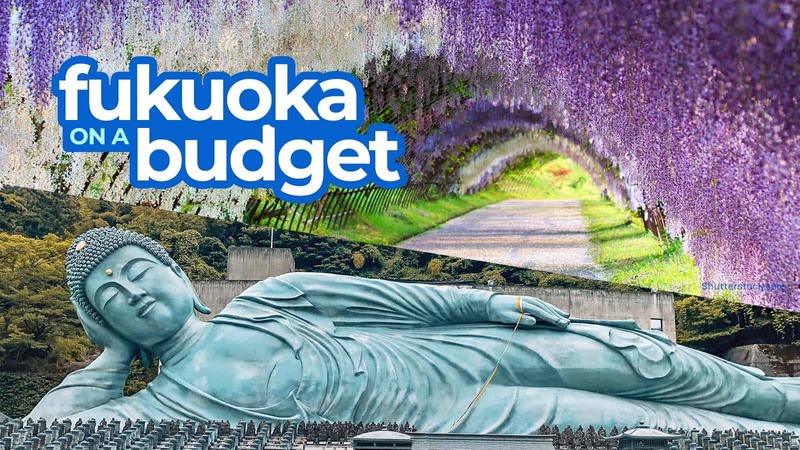 This Fukuoka Travel Guide focuses primarily on Fukuoka City but also features other places in the prefecture that can be easily accessed from the capital. 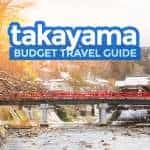 It also includes Fukuoka hotel and tour recommendations, sample Fukuoka itinerary, and other travel tips. Fukuoka is a city that I often overlook. And I mean that in more ways than one. My sister has been living in Hiroshima for a while now. 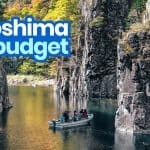 While Hiroshima has its own airport, the cheapest way to get there from the Philippines is flying to Fukuoka. I have done this route many times now. For the longest time, however, the only view I had of Fukuoka was through the window of the plane or the train, never up close. Fukuoka was never my destination, just a place to pass through. That until this year, when I decided to finally stop and see what the city has to offer. It turned out that Fukuoka is delicious. And I mean that in more ways than one, too. 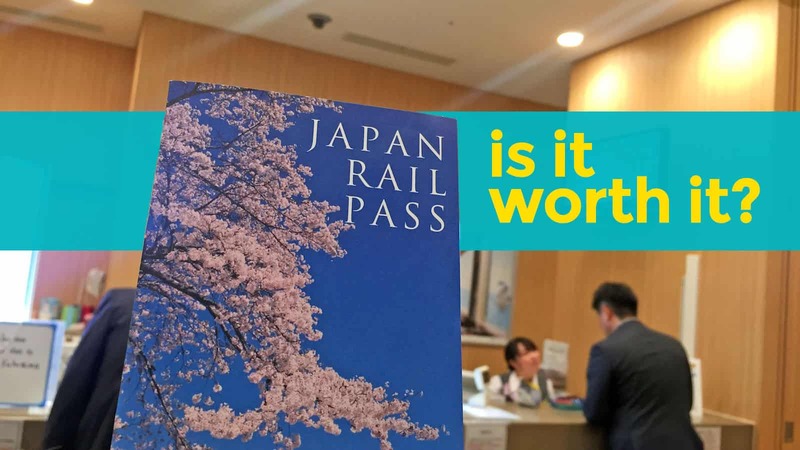 Should You Buy a JR PASS? What is the tipping policy in Japan? How long is the recommended stay in Fukuoka? Do I need a visa to visit Fukuoka? I admit, the biggest reason I wanted to finally explore Fukuoka can be spelled in five letters: RAMEN. Damn. I’m salivating just writing that. (Sorry for the mental image.) But it’s true. Ramen, for me, is Japan’s second greatest contribution to mankind. (Next only to anime, of course, haha.) I don’t understand why it took me so long to give Fukuoka some love and attention. 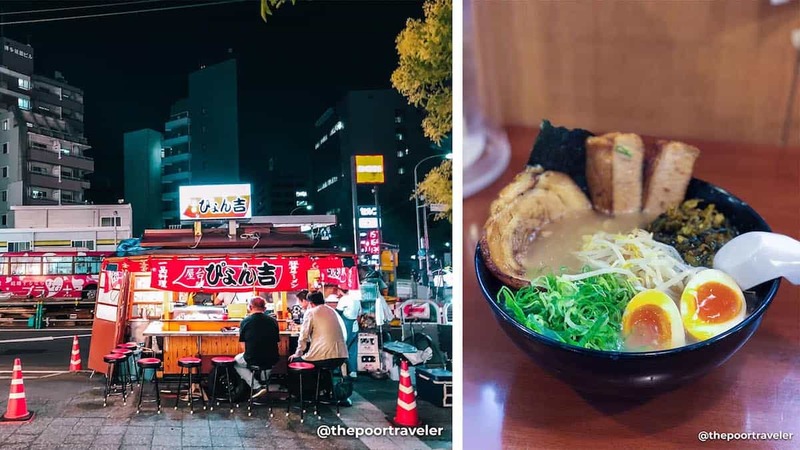 For many, Fukuoka is the ramen capital of the world and the birthplace of the most revered tonkotsu ramen, famous for its pork bone-based broth. In Fukuoka and Kyushu in general, tonkotsu is synonymous with Hakata ramen, named after the city’s central ward. Hakata was a city on its own. But in 1889, it was merged with neighbor Fukuoka, present-day Tenjin, to form a bigger prefectural capital. Today, Hakata and Tenjin are the two wards making up the city center, where most of the action happens. The two are divided by a river. Hakata Station retains its name and is the centrail railway station in Fukuoka. One thing I noticed about Fukuoka is that although it is undoubtedly modern, it moves at a gentle, relaxed pace. 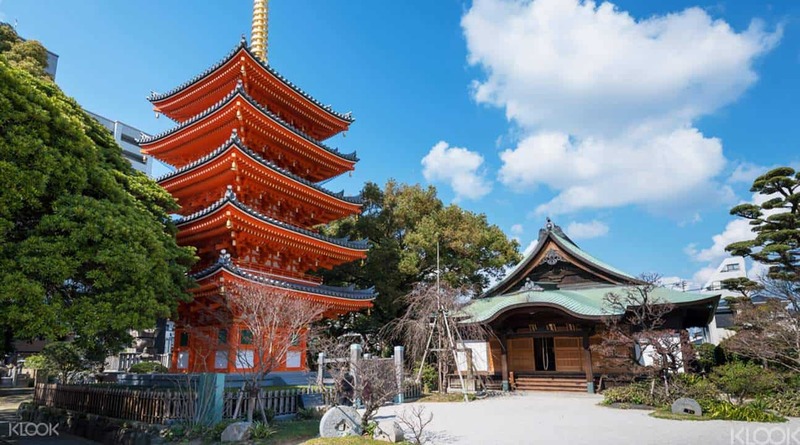 This makes Fukuoka an ideal choice for travelers visiting Japan for the first time or a perfect first stop in a multi-city tour around the archipelago.  Language: Japanese (Nihongo). The majority of the locals seldom speak English, but most of the signs and other tourist promotional materials have English translations. Currency: Japanese Yen (JPY, ¥). JPY 1000 is around USD 9, EUR 7.7, SGD12.3, PHP 479 (as of July 2018). Modes of payment: Most establishments prefer cash payment, but many of them also accept credit card transactions. Electricity Info: 100V, 50/60 Hz. Type A sockets. Plugs have two flat pins. Type B is sometimes used but not that common. October to November, all things considered. These months enjoy pleasant and dry weather, ideal for sightseeing. 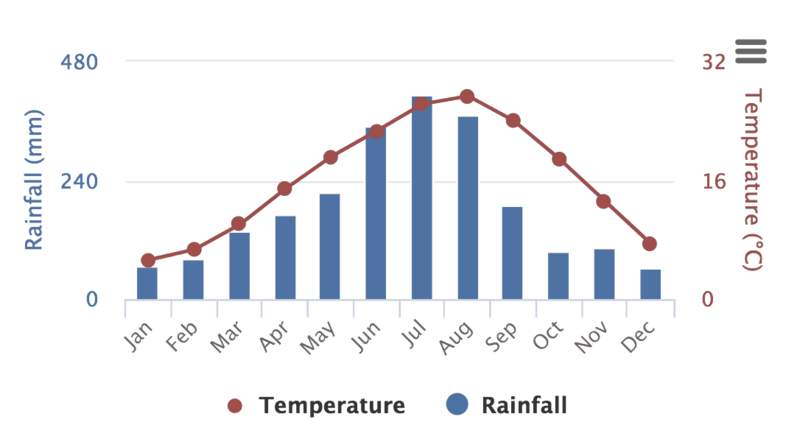 October is when temperatures begin to drop to 18.8C average. 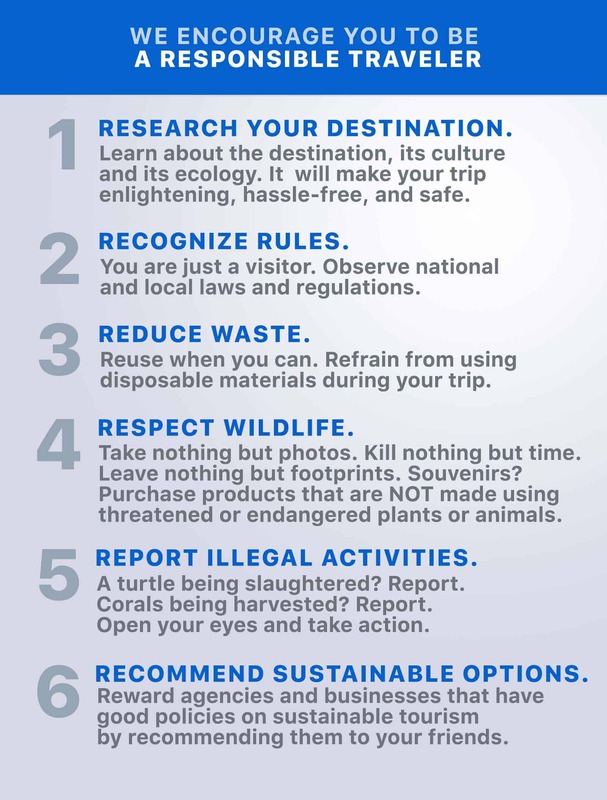 It’s also the least popular among tourists, which makes exploring a lot less stressful. If you don’t mind the cold, winter is a good option too. The temperature can plunge to 5.2C average, but it also sees the lowest precipitation levels. It’s the second busiest season as far as tourism is concerned, especially from January-February. The summer months of June-August are the busiest, the hottest, and the most expensive. Fukuoka Airport (FUK) is the primary gateway to Fukuoka City and Kyushu Island in general. It is Japan’s fourth busiest airport (next to Haneda, Narita, and Kansai) and is connected to virtually every other airport in the country. The cheapest year-round fares for Manila-Fukuoka are offered by Cebu Pacific, which flies every Tuesday, Thursday, and Sunday. Travel time is 3 hours, 55 minutes. This can still go much lower when there’s a SEAT SALE. 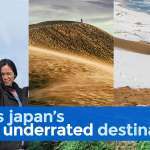 Because it’s not as popular as other Japanese destinations like Osaka and Tokyo, there are usually more promo seats on Fukuoka flights and less competition. 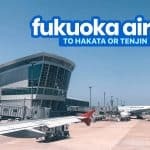 It’s just much easier to snag promo fares for Fukuoka. The good news is: Fukuoka Airport is within the city. Hakata Station, which is the biggest and the central train station in the city, is only around 5 minutes by subway or 15 minutes by taxi. There are also a lot of hotels in the Tenjin area. Tenjin Station is just 12 minutes away by subway. The bad news is: The domestic and international terminals are housed in two separate buildings located on either side of the runway. The fastest way to reach the city center is the subway, but only the domestic terminal has a subway station. No worries, though. There is a FREE airport bus service that ferries passengers from the international to the domestic terminal. Other modes of transportation are also available to reach the city center. If arriving at the International Terminal, you need to take the FREE shuttle bus to the domestic terminal first. Go to Bus Stop 1 and wait for a bus. Alight at Domestic Terminal 2, the last stop, where the subway station is located. Go down to the underground level and get a ticket. Take the Kuko Line for Meinohama or Chikuzemmaebaru. Alight at Hakata Station, which is only 2 stops away. Travel time: 5 minutes. Fare: ¥260. If you’re going to Tenjin Station, it’s 3 stops away. Travel time: 12 minutes. Fare: ¥260. The bus is the cheapest way to reach the city center. Get a ticket from a ticket machine. Even if you approach the manned counter, you’ll be pointed to the ticket machine. Go to Bus Stop #2. If going to Hakata Station, ride the City Bus (Nishitetsu bus). This bus also stops in Tenjin. Travel time to Hakata Station: 15-20 minutes. Fare: ¥260 (Hakata), ¥310 (Tenjin). – If your hotel is closer to Tenjin City Hall or Canal City Hakata, go to Bus Stop #4 and take the Royal Bus. Travel time: Around 30 minutes. Surprisingly, taking the taxi from the airport to the city center isn’t as expensive as I thought. If you’re a group of 3, this is a compelling choice, especially if you have heavy luggage in tow. Because of the language barrier, having a good internet connection in Fukuoka can help save you time and money. You will want this with you to get around: when navigating, using Hyperdia and Google maps, converting yen to your currency, and translating signs. The only problem is, it sells out fast. So if you have a scheduled trip to Japan, reserve it as early as you can. Most key tourist spots in Fukuoka are accessible by subway. If you’ve traveled to Japan before, you’ll have no problem exploring Fukuoka. It’s pretty much the same. If it’s your first time in Japan, it is important to be familiar with how to use the train. One thing that has proven helpful to me again and again is Hyperdia. It’s a web-based search engine that would tell you train schedules and routes instantly. Just make sure you know the nearest train station to your destination and let Hyperdia do the rest. Don’t worry. In the Places to Visit (Things to Do) section below, I’m indicating the station closest to each attraction. For more information on how to use Hyperdia and Japan’s train system, read: HOW TO USE HYPERDIA. If you’re visiting Fukuoka ONLY, you don’t need a JR Pass. It’s only for those who will make multiple long-distance journeys. When is it wise to purchase a JR Pass? If you’re visiting multiple cities in Japan and you’re staying for at least 7 days. If your itinerary is more like that, purchase a pass before your trip. Klook offers the cheapest JR Passes available. If you live in the Philippines, the pass will be delivered to you in 7 days. Fukuoka is easy to explore, and many of the attractions can be accessed DIY-style. However, it would be great if you join guided tours in order to have better understanding and greater appreciation of each stop instead of just gawking at it. Having a guide means having more info not just about the history of the places you visit but also insights into the way of life in the city. Most tours begin at Hakata Station. Fukuoka’s biggest draw: FOOD! Fukuoka is the ramen capital of the world and the birthplace of the super yummy tonkotsu ramen! On top of that, while the rest of Japan isn’t big on street food, Fukuoka embraces it big time, as evident in the popularity of yatai here. A yatai (屋台) is a mobile food cart or stand stationed on the sidewalk. It usually opens in the early evening and closes in early morning. 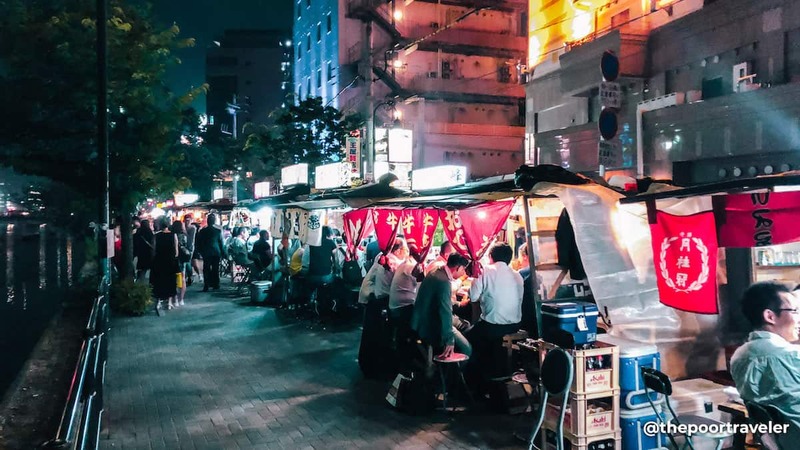 More than half of all the yatai in Japan can be found in Fukuoka. Most of them sell ramen, but other stalls offer a variety of other dishes like hotpot, yakitori, and seafood. There’s even one that serves French delicacies like escargot with wine! We’ve created a separate post for it! Read it here: WHERE TO EAT CHEAP IN FUKUOKA. 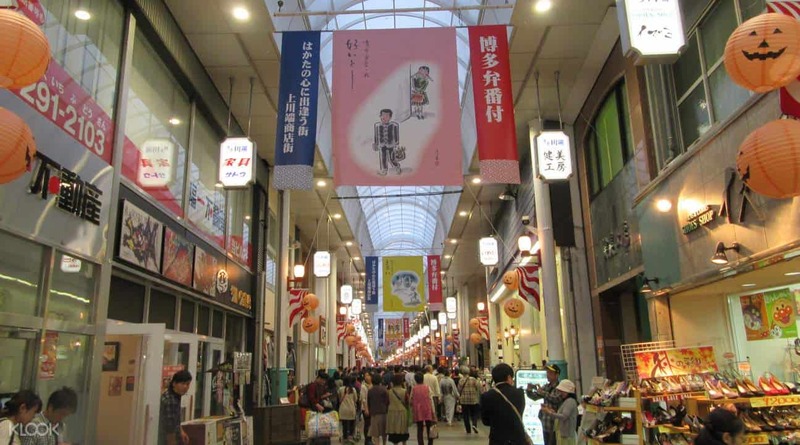 Hakata has always been an eclectic trading city. Many of the businesses especially along this street are run by merchant families. In this tour, you’ll get to have a cup of tea, sample traditional snacks and see local produce! Kushida Shrine, famous for the annual Hakata Gion Yamakasa Festival, which features a time trial race of majestically decorated floats around the city. It’s also where you’ll find the biggest Otafuku mask in Japan and where you can pray for eternal youth. Yanagawa is situated 50 minutes from Hakata Station. Built in 1588, it is a castle town surrounded by moats, used to protect the castle and its inhabitants from enemies and keep away animals. 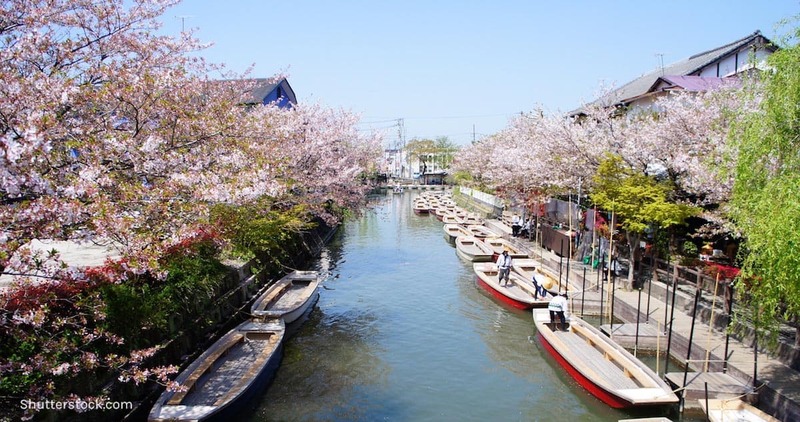 You can cruise down these moats on a small boat, which is great in autumn and perfect in spring, when the cherry blossoms are in full bloom. 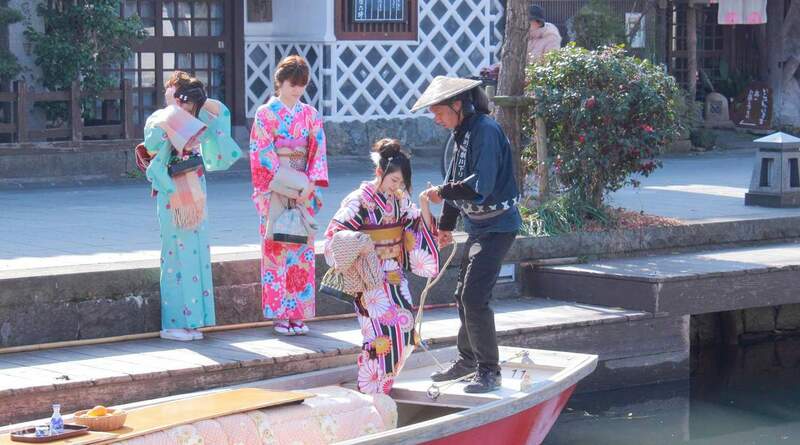 Outside these periods, you can still make this extra memorable by doing it in full traditional kimono set. Great for IG-worthy moments! Nanzoin Temple is located in Sasaguri, 15 kilometers from the city. It is one of the most visited Buddhist shrines in Fukuoka Prefecture and even Kyushu Island as a whole. 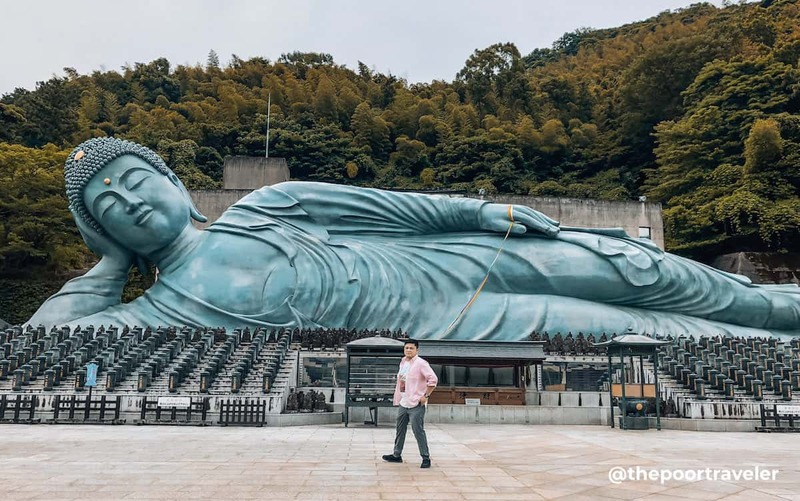 What most tourists want to see is the giant reclining Buddha. Stretching 41 meters, it is said to be the biggest bronze reclining Buddha in the world. If you make it stand on its feet, it is believed to be taller than the Statue of Liberty (excluding the stand). This is not in Fukuoka City but in Kitakyushu, which is the other designated city in Fukuoka Prefecture. 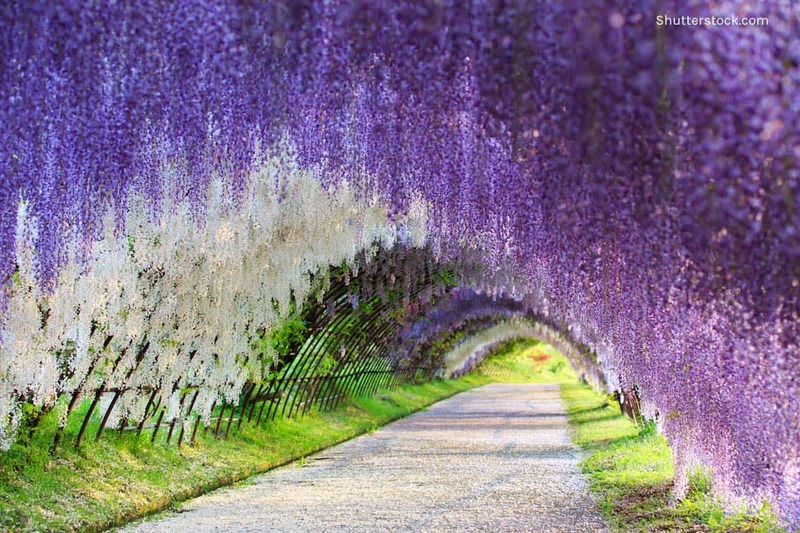 This wonderful private garden shot to fame after several of its photos went viral online, thanks to its two spectacular 100m wisteria tunnels! It has become extremely popular especially during wisteria season which coincides with Japan’s golden week. Yes, it’s best experienced in April-May, but it’s also the most crowded time of the year in the garden. How to get there: It’s quite hard to reach. During peak season (usually last week of April to first week of May), you can take the shuttle bus that takes passengers from Yahata Station to Kawachi Wisteria Garden. Outside this period, you can reach it by taking Nishitetsu Bus #56 from Yahata Station to Kamishigeta. Travel time: 20 minutes. Fare: ¥260. From there, you will have to walk for almost an hour. Open: mid-April to mid-May and mid-November to early December, 8am-6pm. Entrance Fee: ¥500 to ¥1500, depending on the season. 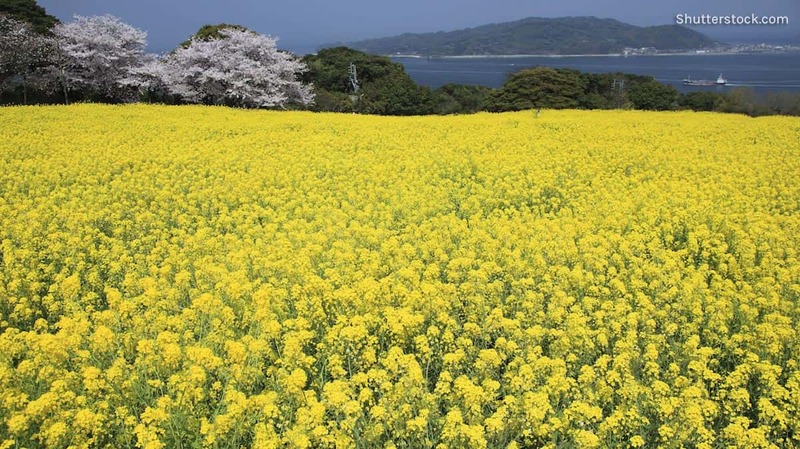 Fukuoka City has plenty of parks that get adorned by flowers come spring, but for more flower power, you can board a ferry to Nokonoshima Island, where you can enjoy various types depending on the season. In spring, you can see cherry blossoms, rapeseed blossoms, livingstone daisies, and poppies. In the summer, the place is carpeted with marigold, sunflower, and scarlet sage. In autumn, cosmos and the fiery foliage take over. In winter, you can still see Japanese narcissuses, camellias, and plums. From Hakata Station, take the Nishitetsu Bus from Hakataeki-mae A to Noko Tosenba (aka Noko Dosenba), which is the ferry terminal. Travel time: 42 minutes. Fare: ¥430. From here, take the ferry to Nokonoshima Ferry Terminal. Travel time: 10 minutes. Fare: ¥230. Then, board the Nishitetsu bus bound for the island park. Travel time: 13 minutes. Fare: ¥230. 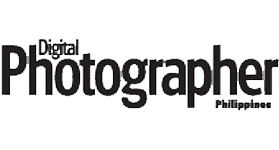 Open: Monday-Saturdays, 9am-5:30pm; Sundays and Holidays, 9am-6:30pm (March-November). Entrance Fee: ¥1,200, adult; ¥600, kid. Ohori Park is located just next to the ruins of Fukuoka Castle. In fact, the park’s pond used to be part of the castle’s moat system. It’s a great place to just relax, walk around, and admire the view. The park is also surrounded by interesting sites including Fukuoka Art Museum (closed until March 2019), Korokan Ruins Museum, and Fukuoka Ken Gokoku Shrine. Nearest Station: Ohori Koen Station. 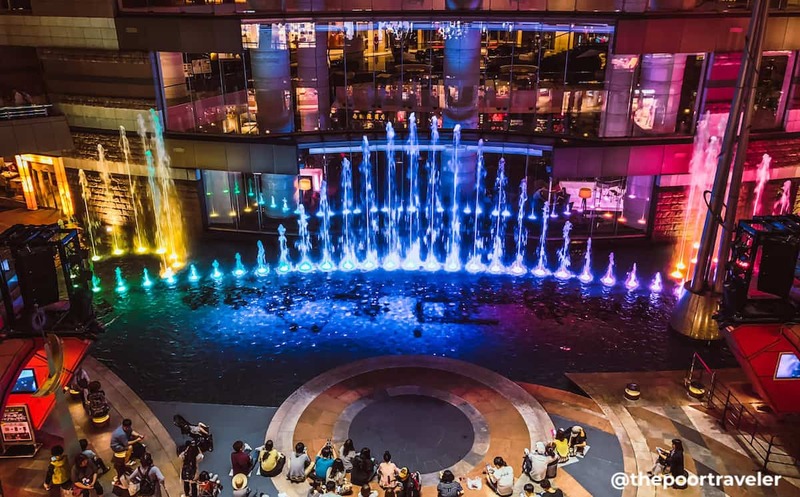 This giant mall is a shopping and entertainment complex with 250 shops and restaurants, two hotels, cinemas, and a canal with a dancing fountain that illuminates. But my favorite part of the complex is the Ramen Stadium on the 5th floor, a collection of eight ramen shops showcasing various styles of ramen! Nearest Station: Hakata Station. From there, you can take the loop bus. But I prefer walking. It just takes 15 minutes or so. Not too far. Fukuoka’s city center is composed of two wards: Hakata and Tenjin, divided by the river. These two wards used to be separate cities. For locals and tourists alike, this area is unavoidable. I always found myself crossing the bridges that connect the two wards. Many key tourist spots are on the Hakata side, but most budget hotels are in Tenjin. If you can, choose a hotel that is not too far away from either Hakata Station or Tenjin Station. As long as you’re close to either, it will easy for you to explore the rest of the city. Hotel Mystays Tenjin Minami. Image provided by Traveloka. If you can’t find one near a station, choose a hotel near the river where Tenjin meets Hakata. This place is rich with restaurants, shops, and other attractions. On my last visit, because I wanted to spend most of my time food tripping, I stayed at Hotel Mystays Tenjin-Minami. It’s located just a block from the river. Tenjin Station is within walking distance, too. And because I’ve been a fan of their branches in Tokyo, I wanted to try their hotel in Fukuoka. 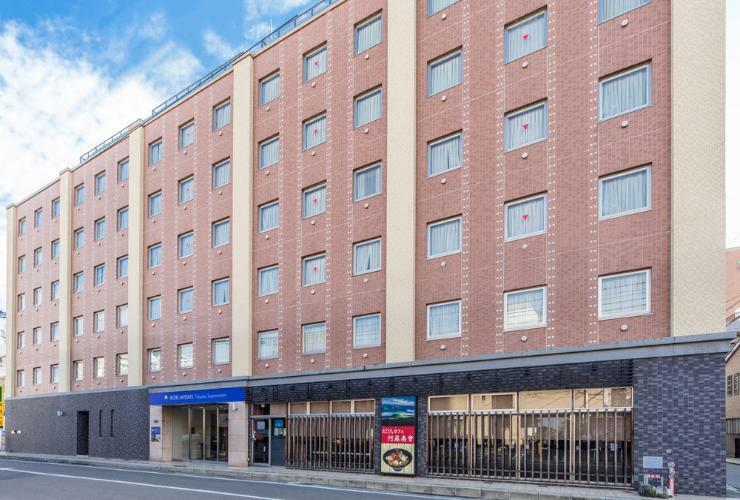 For Hotel Mystays Tenjin-Minami, check rates or reserve here. 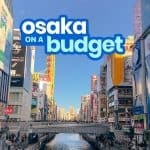 Here are the top Fukuoka hotels below ¥6000 per night, as scored and ranked by Traveloka users. First Cabin Hakata.  Image provided by Traveloka. First Cabin Hakata (Capsule Hotel). Check Rates & Availability. Japanese Ryokan Kashima Honkan. Check Rates & Availability. Plaza Hotel Tenjin. Check Rates & Availability. Hotel Ascent Fukuoka. Check Rates & Availability. Heiwadai Hotel Otemon. Check Rates & Availability. Heiwadai Hotel Honkan. Check Rates & Availability. Heiwadai Hotel Tenjin. Check Rates & Availability. You’re taking Cebu Pacific flight scheduled to arrive in Fukuoka at 7:20pm. IMPORTANT! Because you’re arriving at night, make sure that the first thing you do after going through Immigration and picking up your bags is to collect your pocket wifi that you booked with Klook because it closes at 9:30pm. Your accommodations budget is ¥5150 per night. You can find a bed in a capsule hotel or a single room with that amount. You’re skipping breakfast. It’s healthy (according to intermittent fasting advocates, hehe)! Make the necessary adjustments to match your schedule and preferences. 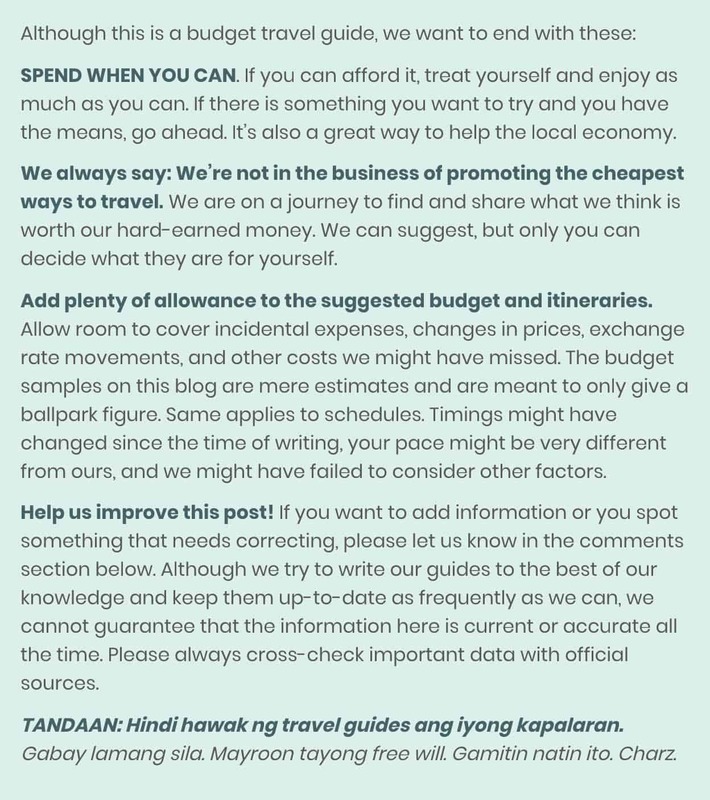 If you’re able to snag P6900 airfare, the itinerary above will cost you around PHP24,000 (JPY50,000, USD452, EUR386, SGD616) ALL IN, including airfare, tours, transportation, travel tax, meals, and accommodations. 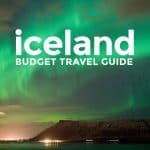 If you have already booked your flights, the itinerary will set you back around JPY32,000 (USD291, EUR249, SGD396, PHP15,450), excluding airfare and travel tax. You can still reduce the cost by slashing your food budget or not taking the guided tour. Convenience stores and supermarkets sell meals for a much lower cost. But you’re in Japan! It would be such a shame to visit Fukuoka and not try their restaurants or even yatai. As safe as any other Japanese city, which means YES, it is very very safe. Irene, a female friend who lives in Fukuoka, says she can walk alone at night confidently. So yes, walk when you can. Tipping is unusual in Japan. Most restaurants have the cashier stationed by the exit so you pay after your meal on your way out. Oh gosh, tough question. If you’re just into sightseeing within the city, I say 3 days. 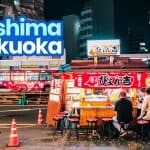 If you’re after food, you might want to stay longer because it is impossible to try the most popular food places in Fukuoka in a week. If you want to see neighboring cities like Kitakyushu, Yanagawa, or even Nagasaki, then just add more. 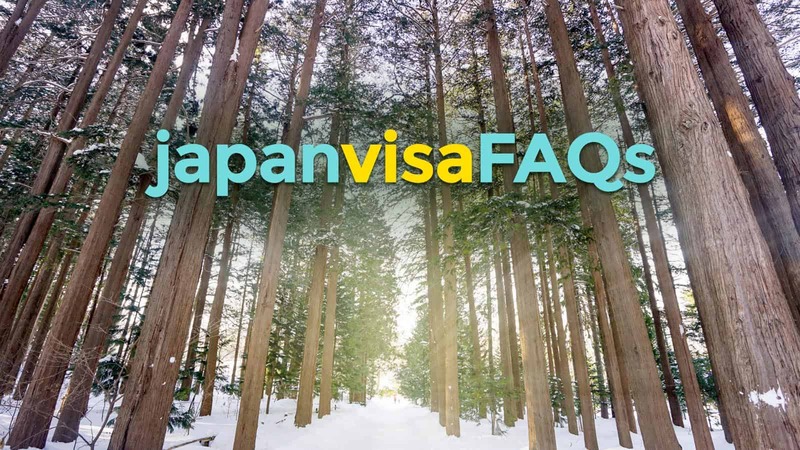 If you’re from the Philippines, YES, you need a Japan visa. The posts below will help you get through the application process. Just want to ask if the line store in fukuoka is still open? Hi! As far as I know, it no longer operates. Hi Enteng, I’ve taken the bus from Fukuoka to Hiroshima a few times, the latest just 2 weeks ago. I don’t pre-book though. I just go to Hakata Bus Center (3rd floor) and buy a ticket there. Usually, there’s only 6 of us in the bus. Hi. I booked a a MNL-Fukuoka flight in May 2019 for 7D and aside from going around Fukuoka, I wanted to go back to Osaka/Kyoto and was thinking if it’s worth it to buy a JR Pass for this route? Or Are there other cities within the vicinity of Fukuoka that I can visit instead of Osaka? Does it snow in Fukuoka? Hi Jong, most likely, yes. Can you tell me the flight numbers of both legs so I can check? Hi. Booked a trip this April. Mnl-Fuk-Nrt-Mnl. In between, going to Osa-Kyo-Gifu. Please tell me how to take the night bus from Fukouka to Osaka. My second time in Osaka so I know where to go. Travelling with family. You can book a Willer bus — just google Willer bus — or go straight to the Hakata Bus Terminal and book a bus there on the day. Hi. I will be in Fukuoka Feb 1 to 6. Roughly 5 days. Would you recommend exploring Nagasaki also? Hello, is there like a card like EZlink where you can load to be used on subways and buses? Hi Pat, IC cards like ICOCA, PASMO and SUICA all work in Fukuoka. Hi. Is there a JR pass we can use for our fukuoka to osaka trip? We’re only planning on visiting fukuoka-osaka-kyoto-nara then go back to the philippines via osaka. Thank you! Do you have any idea where I can buy tourist sim card with Data plan? Hi Yoshke, thank you for this blog. Do you have idea if the Kawachi Wisteria Garden is open for tourists around end of March? Thank You. Hi Zee, ang alam ko, mid-April yung next na bukas nila. Hi. Thanks for sharing this guide. But can I go to Kawachi Wisteria Garden with a wheelchair? I can walk naman po. But if it’s too far, I need to use a wheelchair. Hi after reading this blog I already booked our flight. Fortunately, I was able to booked via Cebu Pacific under promo 5 days & 4 nights, for June. 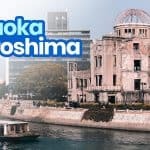 Is it possible for us to visit Hiroshima? If yes, how many hours the travel time if we take the bus? We are planning to stay for at least 1 night in Hiroshima. Thank you so much. God bless you more. Hi Angelica, yes it’s possible.